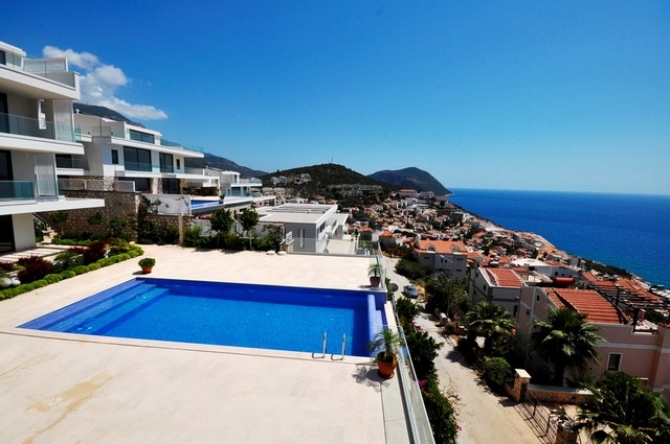 Newly completed duplex apartments with a contemporary design and picturesque views of Kalkan Bay, these really are superior apartments with great communal features. Fully furnished and ready to move in. 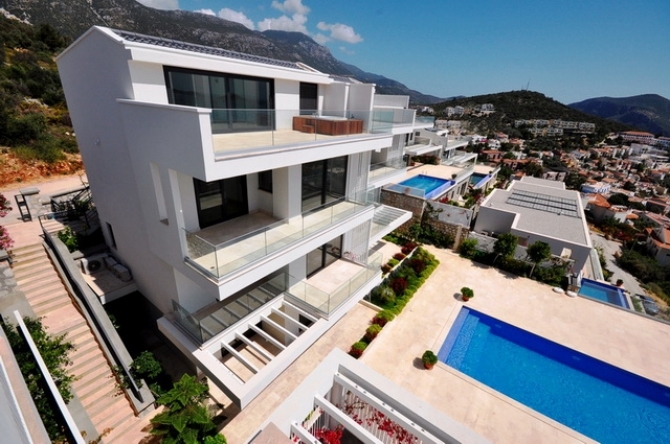 - Second and penthouse duplex with rooftop terraces. The garden level apartments open into an entrance hall, which leads to the open planned design living area and kitchen. The kitchen is fully fitted with a breakfast bar. From the living room you have access to a large terrace which overlooks the big infinity pool and has the most amazing sea views. There is also a cloakroom and family bathroom. The marble staircase leads to two double bedrooms with fitted mirror wardrobes, a second family bathroom and a lovely large terrace balcony. 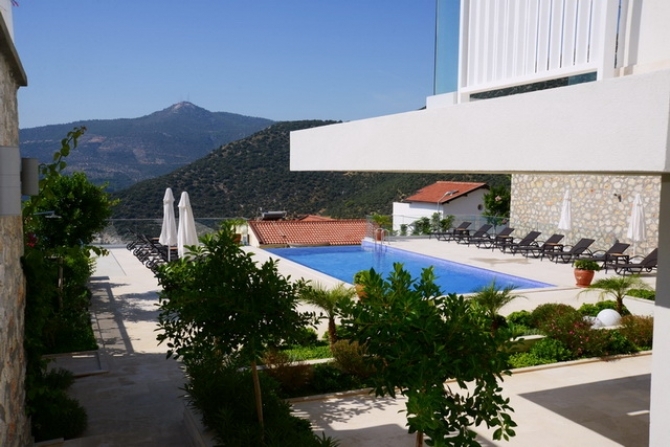 The penthouse duplex apartments are with the same layout as the garden apartments except for the roof terrace with the most beautiful views and a separate area for sunbathing. 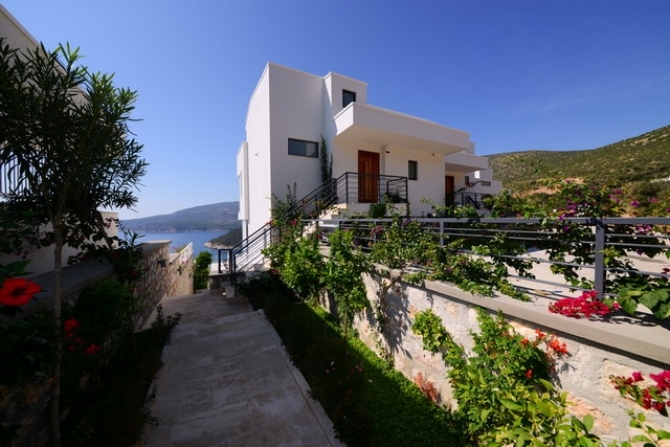 All properties feature marble flooring throughout, full white goods are fitted, air conditioning units in all rooms and CCTV and an alarm systems. All the apartments are two bedrooms and the prices start from 210,000GBP for garden level apartments and 190,000GBP for rooftop penthouse apartments. The complex has nice matured garden areas, plenty of decking area and massive shared swimming pool. 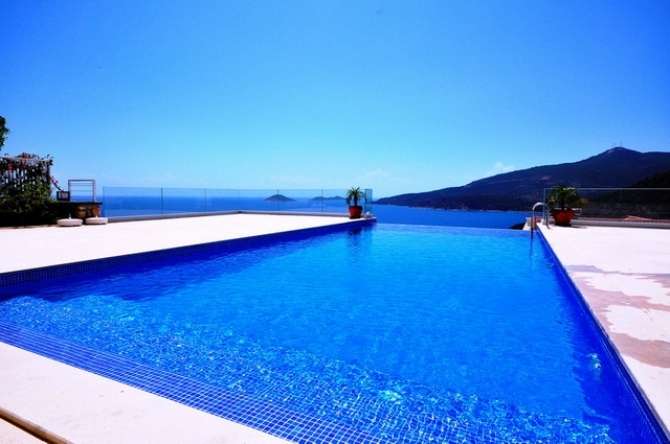 Located in the hill of Kalkan offering amazing panoramic sea views, these stunning apartments are just a short walk from the local amenities and restaurants. You can find several transport options close by that will take you around the region in a short time.